pt::cparam::configuration::tea(n) 0.1 tcllib "Parser Tools"
This package is an adjunct to pt::peg::to::cparam, to make the use of this highly configurable package easier by providing a canned configuration. When applied this configuration causes the package pt::peg::to::cparam to generate plain parser code ready for inclusion into a TEA-based C extension. The command applies the configuration provided by this package to the cmdprefix, causing the creation of tea-based parsers whose class is name, in package pkg with version. 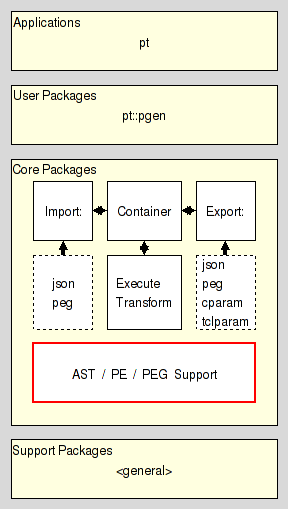 The use of a command prefix as API allows application of the configuration to not only pt::peg::to::cparam (pt::peg::to::cparam configure), but also export manager instances and PEG containers ($export configuration set and [$container exporter] configuration set respectively).